In this public lecture the award-winning journalist with The Guardian, David Conn, drawing on his book outlining the history of Manchester City over the last thirty years – Richer Than God: Manchester City, Modern Football And Growing Up – presents a radical critique of English’s football progress since the establishment of the Premier League in 1992. Richer Than God is an authoritative, provocative, investigative account of Manchester City’s history, culminating in its transformation as Sheikh Mansour seeks to spend the formerly gloom-laden Manchester club into the European elite. When Conn asked an American working in Abu Dhabi whether its economy had been at all affected by the global recession, he said: ‘My friend, we’re richer than God’. It is also a tale of innocence: that of a six-year-old boy transfixed by his sky-blue heroes, coming of age as a writer with the mature understanding that both his club and the game are businesses. Why should modern football continue to claim the unquestioning loyalty of fans, when there is so much in the game to question? David will be reading excerpts from his book, and taking questions from the audience. David Conn is an award-winning journalist, author and broadcaster. He writes for The Guardian newspaper and is the author of three acclaimed books chronicling and critically analysing English football’s commercial transformation: The Football Business (1997), The Beautiful Game? 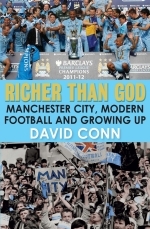 Searching for the Soul of Football (2004) andRicher Than God: Manchester City, Modern Football and Growing Up (2012). In 2010 David was awarded UK sports news reporter of the year by the Sports Journalists Association, an award he also won in 2005. He has been named football writer of the year by the Football Supporters Federation three times, in 2002, 2005 and 2009.